Learn French easily and quickly with audio videos and capsules. 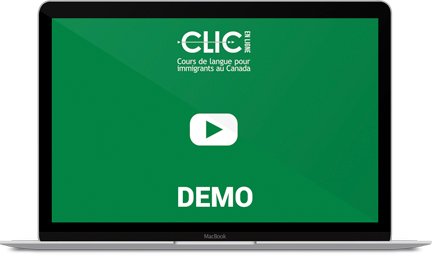 You can now learn French at home with CLIC en ligne. This course will help you learn French and integrate into Canadian society. You are not alone. The program combines group classes and individual online meetings with a teacher as well as independent work on the platform. You get to meet and communicate with other students. Learning French is a team effort! You have a job? You have children? Don’t worry! You learn at your own pace. You work when you want: morning, afternoon, evening. CLIC en ligne is simple, easy and convenient! Asking questions in a store, understanding a work colleague, reading a letter, writing an email, etc. CLIC en ligne offers you a full program. CLIC en ligne meets your needs and answers your questions.